Even closer, pretty good shot of face - looky, a scar! Oh…heh, heh…I’m sort of in the beta now too. Just got so excited I kind of forgot to mention it here. Unfortunately, (to my considerable exasperation) circumstances have conspired to keep me from playing very much up till now. I intend to rectify this fault this weekend. I suppose I am in the beta, as well. Well guys, if you need someone to show you the rope, make sure you create a character in Brandywine and send a /tell to Earendur (that's my current main character). I have a human, a dwarf and a hobbit so I can easily help you with those classes... and the dwarf is close to the elf starting area so I can help you with him if you decide to be an elf. Not that I understand why you would want to be one. Have we actually founded the Barrow-Downs Troupe yet? Just thought I'd ask in case I missed something. Due to server issues I have characters on both servers that have been active this week. Unfortunately, splitting my limited time between two toons means that neither of them has advanced very far. Currently I'm on the Brandywine server, as a Human Champion. And no, I do not think we've founded a troupe. Durelin mentioned it, though, while we were playing through Midgewater Marsh. My character on Brandywine is Fazi. Unfortunately, he's the lesser advanced of the two. I've been playing mostly on the other. I go see if I can't pump him up a bit. I am a human female minstrel named Durelin, CoD is playing as a human male champion named Issith. I'm going to go ahead and set up the BD Troupe today, and we can all at least see what the kinship stuff is like in game. I've got more money in game than I know what to do with, anyway. I hope you haven't set one up already...I made one by the name 'The BD Troupe' earlier. I, like you, have too much money. Actually the kinship's name is now "The Downs Troupe." Unfortunately "Barrow Downs" is an illegal name to use...it makes sense that it would be, but it's still frustrating. We're totally justified! I played briefly as an Elf on Meneldor server, and I must say...you have to try an Elf because of Edhelion, where you start out. It's gorgeous! Anyway, I think I'm buying the game. What was your Elf's name? I've been on Meneldor most of the day playing as Khaless (a play on the Klingon character Kahless. Of course, this fooled absolutely nobody and people have been walking up to me saying "Qapla!" since the toon was born). Which server is the Downs Troupe on? Is it possible to have the same kinship on different servers or does it have to be founded on each server? My elf's name is Sairien. And yeah, the server thing is rather frustrating. "The Downs Troupe" was created on Brandywine server, and I think that it is limited to the server, because it is based around the character that created it. Yes, that means I'm the "leader" at this point. Don't worry, that can change. Unfortunately I created my minstrel on Brandywine, and I love minstrels/bards, so I'm rather hooked there. I should really branch out more, I know. Khaless is a minstrel too. I like him better than Fazi, who is a guardian. However, from my experience from being in a fellowship last night that didn't have a guardian...I discovered that guardians are kind of a bit necessary. The wrong people were continually getting the arrgo and it was really hard to distract the mobs with no guardian. Anyway, we lot are going to have to get organized. I was on Brandywine for a little bit last night and tried to get ahold of you guys. But that lasted for all of five minutes before Brandywine completely crashed (again). So I switched over to Khaless and played him for the rest of the night. I think we may have to set a time for all of us to try and be online. I'm going to try and play Fazi today and (finally) get him leveled up a bit, so if you are on Brandywine you can keep trying to IM him and I'll do the same. I know I can't really plan when I'll be online, only becase I have to play on the family computer. I only really have to fight with my brother for it, but sometimes my dad as well. So I'm used to finding myself disappointed when it comes to planning. Sorry! Typically I'll be on in the early evening on weekdays, and the early half of the day on weekends (EST), if I dare give a usual. The house itself is pretty but it didn't blow me away... what DID was the music! OH MY.... If there is any music that is more Tom Bombadillesque I've never heard it. Agreed. But Tom is not very Bombadilly. His boots simply aren't bright enough to me. And he looks too much like Grizzly Adams Mountain Man. Just thought I'd mention to anybody who didn't know, but the tavern in Michel Delving is called The Bird and Baby. What do you guys think about the looks of the misterious "Strider"? At first I thought he looked a little unimpressive, but after taking a closer look, I think that they did a good job in capturing that "he is more than meets the eye" kind of presence. So now that most of us have been playing for a while, what are your collective thoughts on the game? Well, my impressions of the game are mostly good. 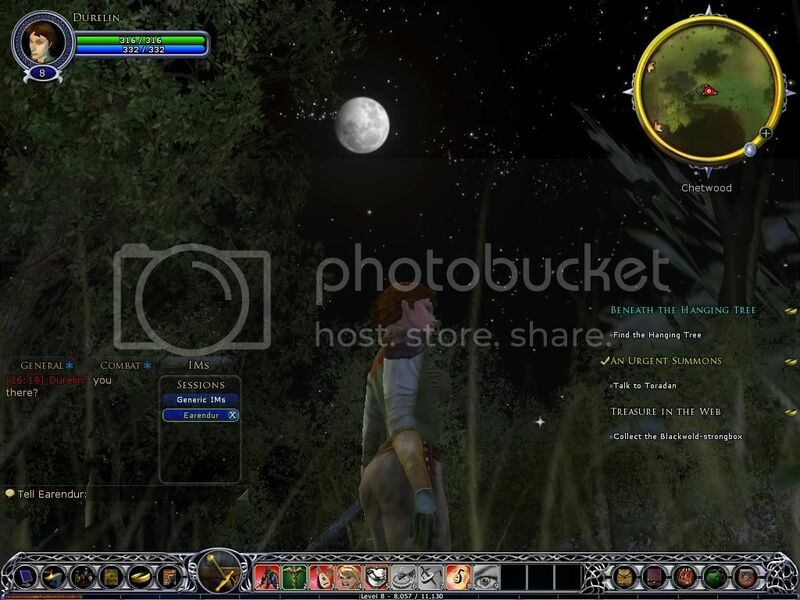 I really enjoy the presentation of LOTRO. I think, rather than capturing a "realistic" look, they did very well to bring out an artistic rendition (like in a work by Howe). Most of the games mechanics seems to be put together pretty well. However, I feel there are a few minor problems. I do not like the way the item durability system works (i.e. the loss of durability for inventory items that are not actually engaged in the game action). Related to the above issue, is that of the actual durability of items. I feel certain things wear out far too quickly. I find it difficult to complete longer instances, such as the Great Barrow, as both my used items wear down, my inventory replacements wear down, and there is no way it seems to repair items in the field, even if they are only temporary ones. I'm afraid we slightly disagree there. I think some of it looks entirely too Conany. I also think that some of the resource distribution in the game needs work. There is far, far too much metal lying about the Shire, you can't go anywhere without tripping over the stuff. In the Blue Mountains you have to hunt and hunt and hunt for it. Something there does not seem quite right. Yes, yes it does. Though, maybe that's representative of the dwarves' strip mining? But, there is a patch coming out today. So maybe that'll fix several of the issues we have with LOTRO. Thanks to everyone for all this information. I think I'll consider this in the summer when my schedule opens up a bit. I also found this review interesting. Nerfed = lowered its power, likely because of complaints about it being too powerful. TURBINE YOU HAD (hopefully still have) A GOOD THING GOING FOR YOU, PLEASE DON'T SCREW IT UP. Sorry. I haven't played it yet since the update (it's brand new), so I'd better not panic. I haven't had a chance to test the game after the big patch... might get to it in a while, but I don't understand why they'd did some of the "retouching" (let's not say nerfing) they did. For example, it seems to me that they weakened (even further) the Captain class... suposedly a meele class, it'd take me for bloody ever to kill just about anything that was not two levels lower than me. I got tired and started playing my burglar. Fortunately, my little hobbit burglar is much more fun. While it's by no means a heavy-hitter on a "fair fight", who said that I'd ever give them a fair fight? and even then, I was able to take two blue orcs and a white one almost all at the same time and survive using only one minor Athelas essence potion. The captain would die from two light blue spiders. "No-one should talk, except to say that they need a heal or to communicate that there was an add"
Still, at least the graphics are looking better every time around (even in my computer, with the "child drawing with crayons" graphic settings). How come your characters weren't in the kinship? I believe he would be one of the uber-1337 players I was refering to earlier. Probably helpful when one is in the grip of mortal combat...especially on the PVP side. So, who thinks they're buying the game? Do you know when the pre-order offer expires? I am worried about how laggy I can get wherever there are more than a couple players running around (i.e. Bree!!!) so I'd love to get a chance to try the game in open beta and pre-order then if everything is working out... but then, I rather pre-order and get the discount monthly fee than miss out on that! Supposedly it ends the day the game comes out - so the 24th of April. I do think it will run a little more smoothly in the final release, but there will also likely be more people. The lag has gotten better for me...at least a little. That stress test weekend, though...ugh, it was unbearable. Yea, the lag has gotten better. But if the stress test is an indicator, I don't think it'll be very fun unless they add several more servers to pick up the load. Surely they will, so I'm not worried about that. My only worry concerning the servers is what they consider to be the general population limit, which if too low can make for some unpleasantly long waits to get into a server. When the game comes out, which server are other people going to be playing on? I personally prefer to avoid the first server because they tend to be the most crowded. I think here we're faced with a conundrum (spelling?) of epic proportions. Unless all servers that will be open at release are also open during Open Beta, if I buy the game with the Founder deal, I will have to play in whichever server the character I've kept will be at.. on the other hand, if all servers are open, I'll just go to the last one on the list. Or the second-to-last, still down at the bottom, but avoiding all those who think "I'll go to the last one to beat the lag "
By the way, after the next wipe, we should all agree on which server to play on! 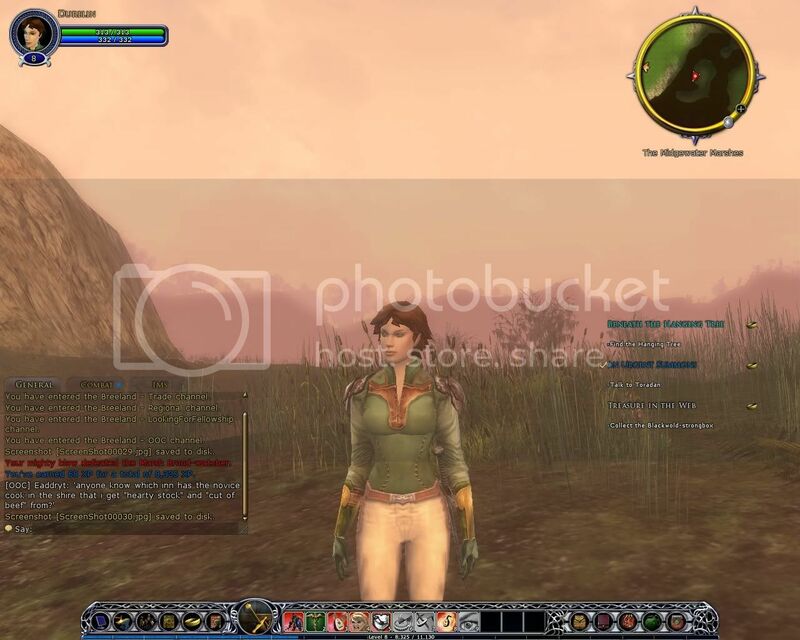 Which reminds me, if you are in Brandywine, look for Annagil my elven hunter (and current main)... though I haven't been able to play as much lately. The character wipe for the end of Closed Beta will be on Monday.... I was thinking that we should all have a party at the barrow downs tonight (I say tonight 'cos I figure it'll be easier that a Monday night). If you are interested, let me know ASAP, and also what time would work for you. I'd suggest around 10 PM CT, which would work best for me, but that might be tough for anyone on EST time. I know, the 'downs is not the best place for a party, with all those wights and all... but I believe we have some high-level characters, so we should be safe. I think a party could be arranged on the Barrow-Downs. Late tonight would probably be best. If Kuru is up for it, I'd say go ahead and meet up somewhere (near Andraste, maybe?) and I will definitely try to attend if I am able. By the way, has anybody else noticed the Merisuwyniel smiley? So, follow the train of drunken dwarves staggering across the Lone Lands? I'll really try to get on. Though, I have a 6-9pm class tonight. Was there a Barrow-Downs "Table for Two" party last night? Hey, I'm going to have a lot of money that I can't keep after I sell off all the crap (the vast majority of my stuff) that I no longer have an immediate use for and can't keep. May as well spend it on food and beer. Not exactly, Farael went questing in the east, and I stayed and partied in Bree. Last edited by Kuruharan; 03-26-2007 at 09:00 AM.